intuVision Retail analytics provide you with actionable intelligence about your business, big or small. intuVision VA Retail can detect customers waiting too long in line and send email alerts directly to supervisors. Over time this information can be collected and analyzed to better allocate resources. Heatmaps of customer walk-through patterns provide information about sought-after products and the efficiency of various displays. Knowing customer flow patterns allows for optimal product placement and efficient floor setup. Read customer story and testimonial here. The customer is a luxury goods retailer specializing in leather, lifestyle accessories, and perfume. The challenge was accurate customer counts without replacing existing security cameras. The solution? intuVision Retail. intuVision VA offers the unique capability to add as many events and event rules to each of your cameras - meaning that with the same camera you can count people entering, generate a heatmap of paths taken, and look for after-hours intrusions. As with the other modules, intuVision Security events also include those in the intuVision Core module. Activity Detect any moving object activity in a zone, can be limited to people or people with carts, etc. Capacity Detect when too many people are around a valuable display or waiting for help from support staff. Camera Tampering & Quality Loss Detect when a camera view has been obscured or blocked, either unintentionally or maliciously. Coverage Monitor periods of activity/non-activity around counters or service desks to ensure staff are present. Direction Detect people moving in the user specified direction. Dwell Time Log the time spent by customers in various store areas, know where and for how long customers tend to linger. Enter/Exit Detect people entering or exiting marked areas or people entering employee only areas. Input/Output Count the numbers of people passing through a region to get queue service rate and the renege percentage. Loitering Detect people milling around. Object Taken Detect when a monitored object is removed from its place. People Counting Count the customers entering and exiting the facility. This information can be graphed, reviewed, or exported as a CSV file. Queue Density Notify staff if queue areas are full, ensuring short wait times. Throughput Detect objects crossing user specified edges of the zone. An internationally known, high-end retailer wanted a solution that would integrate a video surveillance system and video analytics into one easy-to-manage system. They tested several competing systems in their highest trafficked store in Los Angeles, California on Rodeo Drive. Their goals for the test included an accurate people counting system, easy-to-use video management system and a server that could handle all the systems without requiring additional expenses and maintenance. After 90 days of testing, they decided on the intuVision and exacqVision integrated solution. The retailer installed intuVision Video Analytics integrated with exacqVision Z-Series network video recorders (NVRs) throughout their US stores. The seamless integration between intuVision video analytics and exacqVision VMS software makes it possible to use a wide range of video analytic rules on any camera for both security and business intelligence purposes. 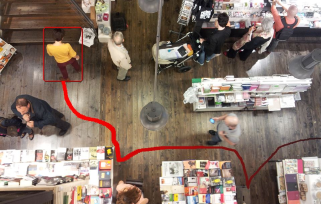 This retail company uses powerful intuVision video analytics to count people entering their stores as well as to detect people loitering after hours. intuVision video analytics has provided the retail stores with 98% accuracy in counting customer traffic throughout their stores. "intuVision video analytics gave us accurate counts of customer entry and exits without the need for a dedicated camera over the door,” said the Director of Loss Prevention. “Competing products we tested required using a dedicated camera to conduct people counting and still had problems with groups of people coming in at the same time." The intelligent features within the intuVision and exacqVision system provided detail and a high level of accuracy to analyze video footage and collect better business data. 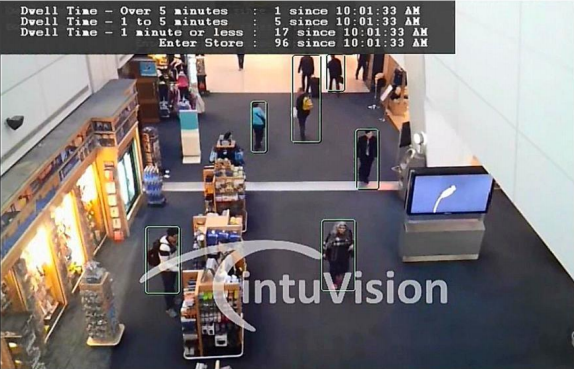 intuVision video analytics provides intuitive statistical information on people's activities in the stores and keeps hourly logs of how many customers have entered and exited a store. Additionally, they can count how many cars come in and out of their parking lots and monitor the perimeter of the building. These statistics are used to measure and report on sales to improve on the overall sales. Store employees control the PTZ cameras within the exacqVision client to better investigate the events detected by intuVision VA and create optimal store views. Additionally, intuVision VA sends soft triggers to the exacqVision software to alert the occurrence of specific events to record video when those take place. For example, without a gate around the perimeter of the stores, they can easily monitor and view activity outside of the facility at night from the exacqVision client or mobile app when alerted by intuVision VA, if someone is outside the building after hours. Security staff easily conduct investigations with the powerful exacqVision thumbnail and timeline search capabilities. The intuVision and exacqVision integrated solution improves all aspects of their business. By having the accurate customer counts from the video analytics integrated into the VMS software, they have accurate business intelligence data to provide to their operations and sales teams to use to drive more store traffic and adjust store promotions based on the metrics provided. 360 People counting & Heatmap - intuVision VA is fully set up to process video from 360 degree cameras, allowing you to cover more area with lower cameras. Here you can see people counting and a heatmap of motion through the view. intuVision Retail Queue Length Detector - Detect over-long queues, and send notifications to open more registers. intuVision queue length detector is part of intuVision Retail, and can be used in a variety of ways, including immediate reaction (sending staff to open more lines), or for the future, to better estimate the staff requirements for different shifts. Dwell & Customer Counting in One View - intuVision video analytics used in two different capacities for the retail domain. 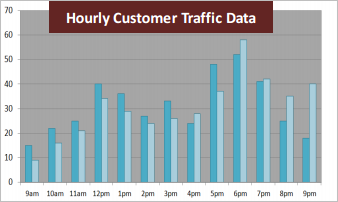 Count customers as they enter and notify when dwell times exceed a few minutes - indicating that customers may have questions or find specific displays of interest. intuVision Retail Overview - Many more intuVision Retail events are available, and with our unique event set-up, you can add as many events as desired to each camera.